1978 - Born on 25th May. 1993 - From 1993 to 2006 he worked together with many photographic agencies (through he travelled to France, United Kingdom, Italy, Germany, United States, India, Brazil). 2002 - Graduated in Arts. 2003 - Started to teach Press Photography at Università Cattolica of Milan. 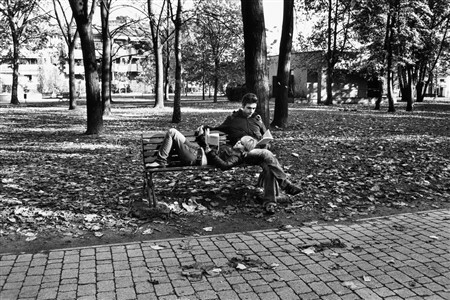 2004 - Published Italian Lovers (Eight Frame, 2004). 2005 - Published An Italian Village (Dreams Creek, 2005). 2006 - Published Spoon River, ciao (Dreams Creek, 2006) with texts by Fernanda Pivano. 2009 - Started to teach History of Photography at Università Cattolica of Milan. 2009 - Published Italian Students (Dreams Creek, 2009). 2010 - International Photography Awards: Honorable Mention in Book - Documentary category for the winning entry "Italian Students". 2002 - London (UK), Paris (F), Milano (I), Roma (I). 2003 - London (UK), Mexico City (Mex), Koln (D), Milano (I), Venezia (I), Paris (F), Madrid (E), Roma (I), Firenze (I). 2004 - London (UK), Paris (F), Milano (I), Roma (I), Firenze (I), Napoli (I), Bari (I), Genova (I), New York (Usa). 2006 - New York (Usa), San Francisco (Usa), Milano (I), Roma (I), Tokio (J), London (UK), Firenze (I), Paris (F), Rovereto (I), Napoli (I), Bari (I), Bologna (I), Genova (I). 2010 - Piacenza (I), Rimini (Italy). London, private collection. Montreal, private collection. Lausanne, private collection. Sidney, private collection. Firenze, archivio Alinari. Milano, Fondazione Mazzotta. Tokyo, private collection. Paris, private collection. Rovato, private collection. Lecco, private collection, Rovereto, private collection. Press [selection]: Schwarweiss (D), Photo-book (Gr), British Journal of Photography (UK), Panorama (I), Il Corriere della Sera (I), La Repubblica (I), Il sole 24 Ore (I), Il Giornale (I), Il Giorno (I), QN (I), Libero (I), Il Manifesto (I), Photo Italia (I), Il Secolo XIX (I), Immagini Fotopratica (I), Gente di Fotografia (I), Photo Selection Magazine (F) Il Venerdì di Repubblica (I), Magazine del Corriere della Sera (I).